I’ve mentioned before that my daughter has become a vegetarian. I’m afraid that at this point she really means it. No. More. Meat. While that may be fine for her, her mother is having a difficult time of it. What? No bacon? No burgers? While I may not embrace her choice, I do support the decision and I certainly want to be able to provide some tasty snacks, so I’ve been honing in on some of the foods that she does enjoy. This week, I’m experimenting with the lovely sweet potato. The sweet potato is the ugly duckling of the vegetable world. This strange looking tuber actually transforms into some beautiful, not to mention tasty, food. 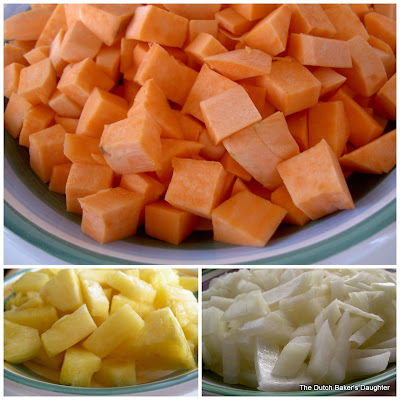 Not only that, it provides some serious nutrition….this is a root vegetable that qualifies as an excellent source of vitamin A (in the form of beta-carotene), a very good source of vitamin C and manganese, and a good source of copper, dietary fiber, vitamin B6, potassium and iron. And did you know that a yam is really just a sweet potato with a different name? I like just saying the word yam. So now that we have a great tasting, fun sounding veggie, what do we make with it? Hmmm. How about a Sweet Potato Bruschetta? Begin by toasting the baguette slices. I do this by placing them on a large cookie sheet and putting them in a 400 degree oven for a few minutes, until they are nicely browned. Remove them from the oven and drizzle a bit of olive oil on each slice and then rub each slice with the cut clove of garlic. Then, simply top each slice with a spoonful of the Sweet Potato Chutney. I cheated this time and just used a flavored dipping oil. See the red pepper at the bottom? It gave the oil just a bit of a kick. Heat the oil in a medium sized saucepan over medium/high heat. Add the crushed red pepper and the chopped onions and saute for about 5 minutes. Reduce the heat to low and cook the onions until soft and just starting to brown, about 15 minutes. Add the remaining ingredients to the saucepan, stirring well. Cook over medium heat until the liquids boil down and the sweet potatoes are tender, about 30 minutes. Cool to room temperature. Doesn't this picture just shout beta-carotene? Omg, your pics are sooooo beautiful and FRESH! Looking forward to more yammylicious recipes hehehe. As for the vegetarian thing, went thru all 3 daughters, 2 reverted back to carnivores, one holding strong. I supported them too. I wish I could do it! Those look amazing, I should make them for my girlfriend. Sweet potato is her thing. Great pics too! Is that all natural light? i'm not a huge yam fan...but i like yam fries...and your chutney looks wonderfully delish. with the pineapple? holy cow! Cathy, you're too funny-Yambalaya indeed! I love sweet potatoes any way they're fixed. One of my favorites is to just bake them and then eat them with butter and a little salt. I'm transported. This chutney looks serious. I would NEVER have thought to use it on bruschetta. Great idea! What an interesting combination of flavors for a bruschetta! I would never have thought to use sweet potatoes this way but I'm pretty much open to anything once!